The Holga 120 PAN Panoramic Camera from Holga is medium format film camera that takes 180º panoramic images on 120 format color or black and white film. It utilizes a 90mm fixed focal length lens with a fixed aperture at 1/100 second shutter speed. Focusing is adjustable in four zones: portrait, small group, big group, infinity. 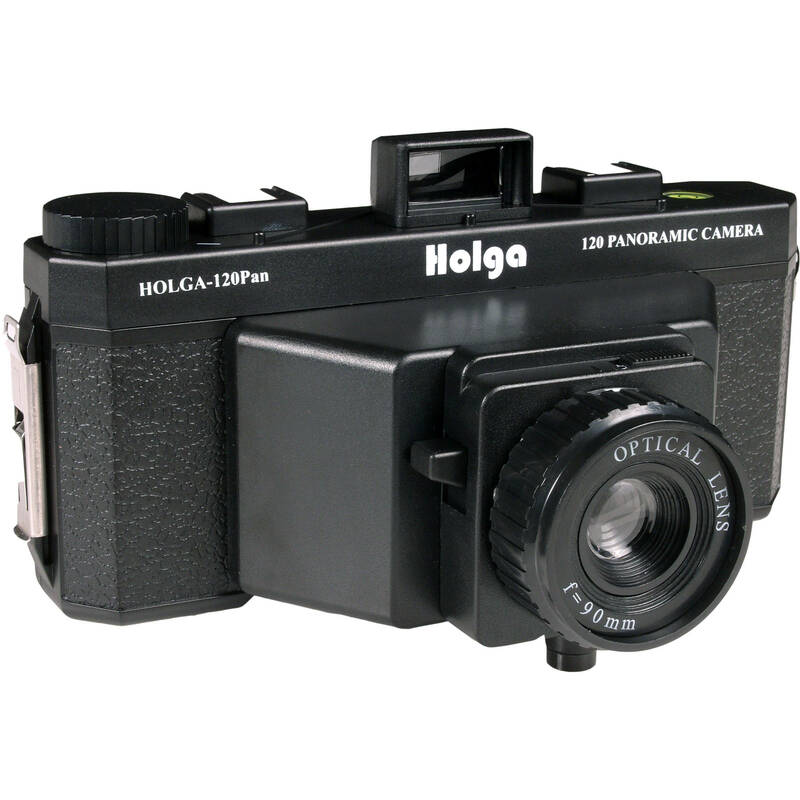 It offers little in the way of manual control and adjustment but offers panorama images with the renowned Holga look. It provides an eye-level viewfinder, two standard hot shoe mounts, a tripod mount and needs no batteries to operate, simply insert the film and shoot; six (6 x 12 cm) exposures per roll. Box Dimensions (LxWxH) 8.6 x 4.7 x 5.0"
Holga 120 PAN Panoramic Camera is rated 4.5 out of 5 by 2. Rated 4 out of 5 by j_sho from Loving this so far I wanted to experiment with medium format film and get large panoramas at the same time without having to drop too much cash. This toy camera has performed just as I had hoped! On the 100 ISO black and white film, I got almost no light leaks, without having to do any modifications to the camera. The film wound evenly and tightly, so I had no issues with fat film either. The focus is a little soft, but I expected that from the plastic lens. I will get the shutter release kit to cut down on blur too, it's nice this camera has a tripod mount. This camera was less expensive than other panoramic toy film cameras and B&H had the best price for this camera of anyone I saw! There are great tutorials online for how to modify this camera, which I will probably do, as the strap harnesses are a little loose, and have slipped off the camera while it was around my neck (the film did not get exposed when it fell luckily!) I expected this, though, from a toy camera. Also, I found the recommended 400 ISO film to be way too over exposed when shooting on a cloudy day, and this film even got exposed by the numbers on frame count window. I would recommend shooting 100 film on a longer exposure. All in all, this is a great camera for fun shoots or experimenting with a new medium, at a price that won't make you feel guilty. I would definitely recommend!